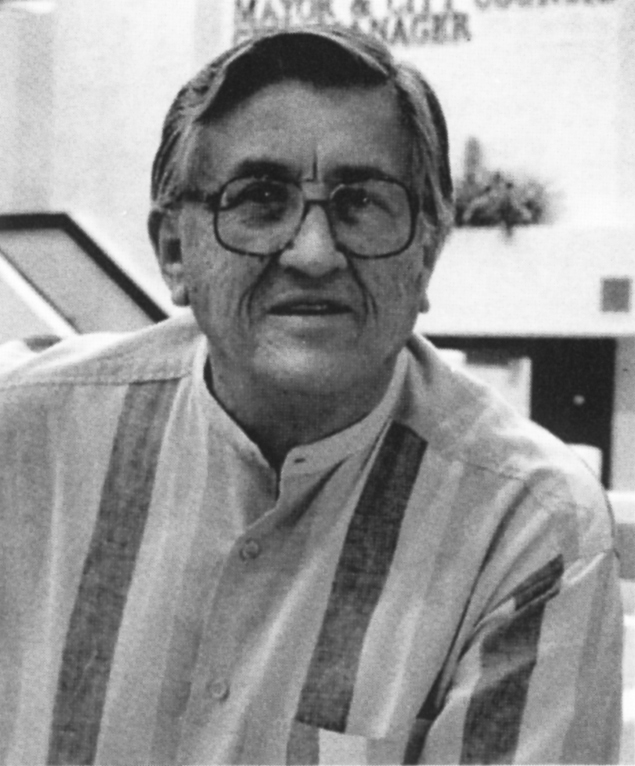 Bennie Montague Gonzales is recognized internationally for his design of distinctive Southwestern architecture. A Phoenix native, born in 1924, his early years were spent on the family farm on the outskirts of town at 20th Street and Osborn. Bennie’s father died when he was seven years old, and the family moved to an apartment on his uncle’s property at 16th Street and Van Buren. To help support the family, Bennie worked at odd jobs with his contractor uncle, S.L. Cahill, who had a significant influence on his life. Through these early jobs with his uncle, young Bennie was able to experience first-hand the building of such projects as the Arizona Biltmore Hotel. At fifteen, under his uncle's supervision, Bennie built his first house, for a family member. In 1942, after World War II broke out, Bennie Gonzales enlisted in the Coast Guard, and his military service exposed him to the architecture of the cities where he traveled. Upon his return to Arizona, he enrolled at Arizona State University. While at ASU, Mr. Gonzales married, took a job as a fireman to support his family and, after five years, graduated from the architectural program. With the support of a grant, Bennie Gonzales furthered his studies at the acclaimed University of Mexico Architectural School in Mexico City. There, he was greatly influenced by the Mexican ruins and free-flowing local architectural style. In 1958, Mr. Gonzales returned to Phoenix. Early projects soon defined his style: design within limited budgets, the need to incorporate local materials, and the use of adobe. He was also noted for the use of concrete block, an economical and durable material; it was an influence both from his days at the Arizona Biltmore and as a fireman. Mr. Gonzales is credited with conceiving the paint color, Navajo White. He also had foresight in predicting the growth of Arizona and, with this in mind, he designed his buildings to be timeless. He won acclaim for outstanding design on limited budgets with one of his first projects, the library in Nogales, as well as the civic buildings in Scottsdale. Bennie’s uncle, S.L. Cahill, built the Heard House, and Bennie was honored with the commission by the Heard Museum for the first additions to and renovation of their facilities. Some of his other accomplished projects include developing a cultural complex for the Hopi Indian Tribe on Second Mesa; designing the State of Arizona exhibit at “Century 21” in Seattle, Washington, and remodeling the former Douglas Mansion in Jerome, Arizona into the Jerome Mining Museum. Mr. Gonzales also designed The Woodlands in Houston, Texas; a $1.5 billion dollar palace project in Saudi Arabia; one of the first condominium projects in Arizona, located in Litchfield Park; Yavapai Community College and South Mountain Community College; numerous resort projects throughout Mexico; and many acclaimed residences. Bennie Gonzales maintains an architectural studio in Nogales, Arizona, where he and his wife, Dianne, live and work. Historymakers is a registered trademark of Historical League, Inc.